Our Person of the Month for this issue of JMS is Theresa M. Brumble, RT(R)(CT), LMT, LLLT from Northfield, New Jersey. Our readers choose her submission ‘Medical Massage vs Chronic Headache’ as a Winner of JMS’ International Case of the Month Contest of 2018. Our entire SOMI team works and exists for therapists like Theresa. Her dedication to the profession and her patients matches her thirst for knowledge, massage science and clinical expertise. She is near graduation from our certification program (CMMP) and we wish Theresa even more professional success and helping patients in great need. JMS: How did you get into massage? T.Brumble: I had moved back to New Jersey from Portland, Oregon in 2011 after the passing of my grandmother. We were very close. I felt I should return home after 16 years. My main career was in radiology. I was a CT/MRI technologist for more than 8 years. There weren’t a lot of job openings in the area and I felt I needed to supplement my income. I had a good friend who was also a technologist, but was a massage therapist for 20+ years, too. So, one day my son and I stopped into the local massage school. The only one I was aware of at the time. The National Massage Institute of Philadelphia. They had a campus in a nearby town. I spoke with the admissions officer and began classes in October 2013. I knew I wanted to be on the medical side of massage. I started my practice and had my own office before I graduated in a local gym part time. When I lost my CT job in March 2016, I knew I only had massage to fall back on! Then in Sept 2017 I took my first Science Of Massage Institute class with Dr. Jeff Cullers and knew I was right where I was supposed to be! Enlightening experience at 51! JMS: Please tell our readers more about your practice. T.Brumble: At this point my practice evolved from just therapeutic massage and laser for pain to Medical Massage and laser for pain! I rented space from a wellness center for a bit, but when I had a waiting list for 4 months straight, I felt it as was time to open my own office. I opened my new office in Somers Point, New Jersey about 10 minutes from the Atlantic Ocean. I am in a central location for several towns around me. I also have another massage therapist taking the SOMI classes renting a room from me. I have not advertised yet and it’s been all word of mouth. I have been working on everything from headaches to herniated discs. I started out with 37 clients and now have 2 drawers filled with files! Too many to count! I feel so blessed and love my patients. They all come to me by recommendation and work really hard at following my homework instructions. I have an inversion table and I’m working on local pool locations for a membership. These are the two main requirements for the herniated disc protocol. JMS: What is your opinion of Medical Massage and how has it helped your practice? T.Brumble: I think the Medical Massage curriculum designed by the Science of Massage Institute should be taught in all massage schools! I witness daily the clinical effectiveness of Medical Massage for my patients. Right now, in my area, massage isn’t recognized as anything but a spa service! However, I already have a PT and a non-surgical orthopedic doctor who share mutual patients with us. 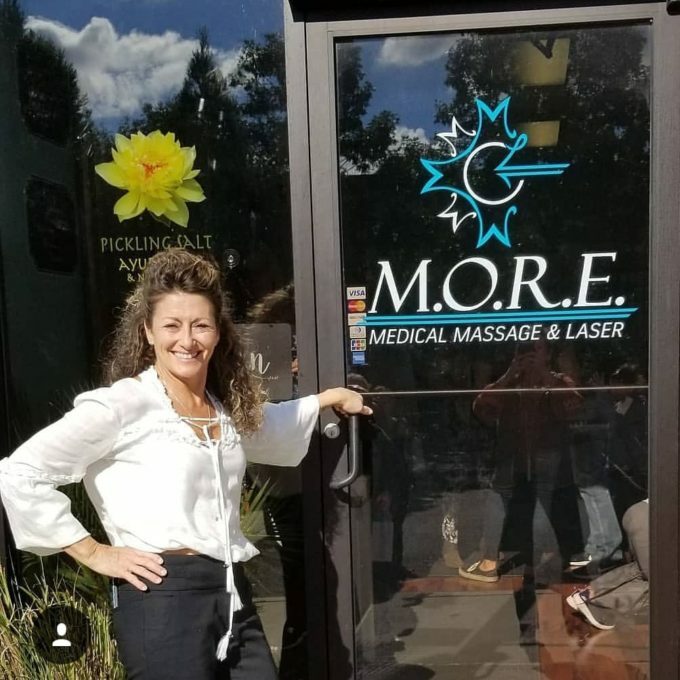 I was also informed recently that a very large rehabilitation group sends all their Medical Massage patients to therapists more than 100 miles away. So, in May when Dr. Ross comes to my office to conduct a Medical Massage seminar and I receive my CMMP certification, I will have the opportunity to market more to rehabilitation centers, primary care physicians, neurologists and orthopedists in my area. JMS: What is your opinion of SOMI’s clinical validity? T.Brumble: SOMI’s approach to massage practice and education has been validated throughout my practice. The positive outcomes my patients and I see are simply unreal! When I work on patients and they tell me when I’m done that, they don’t have even residual pain and functions now are completely restored it is so rewarding! When a patient says that I’m the only one who has been able to help them out of pain I am humbled! When I can help patients to get off the pain medication or completely eliminate debilitating headaches they suffered for years, it just proves the validity of the Medical Massage concept and its application. I learned all of that from SOMI. JMS: What is your favorite type of body work? T.Brumble: My favorite type of body work would be working around the neck. I have had the most success with issues of the neck. I am amazed by the techniques of cupping and periosteal massage as well as vibration. My least favorite body work would have to be shoulders. I am so very grateful and honored to have had the opportunity to learn from both Dr. Jeff Cullers and Dr. Ross Turchaninov. If it weren’t for the knowledge that Dr. Ross brought here to the US, I wouldn’t have been able to help patients the way I do right now. The fact that Dr. Ross shares his knowledge and expertise with therapists, in the smallest details, shows his dedication and professional integrity! Thank you, Dr. Ross and the entire SOMI crew, for all your hard work on your books, taking the time to travel around the country to teach us all you know and the ongoing support you give to us, your students and future CMMPs! Thank you for such an amazing professional experience! I am looking forward to learning more from Dr. Ross in the future!